Our current generation is all about innovation, science and technology. Technology has found home in nearly every industry imaginable, including the health and fitness industry. Today, there are various head to toe wearable innovations on the market making big rumbles in consumer tech. The groundbreaking application of high-tech science in the fitness industry is converting traditional mechanical tools to advanced fitness enhancement gadgets. From heart-rate trackers to step counters to digital workout coaches from the likes of Apple, Garmin and Fitbit, these gadgets have raised the bar for health and fitness technology in some amazing new ways. They make your workout easier and improve your form by measuring your performance, suggesting workout routines and exercises and tracking your stats. Using gadgets and health apps to track workouts is common nowadays. The gym is certainly one of the places that needs more efficiency and high-tech gadgets. And I’m not talking about conventional gym equipment like bench press stations and treadmills. I’m talking about smart gear that you can bring along with you for your workout sessions. With smartphones now more than just tools of communication, carrying a smart gadget can help you track vital stats and provide you with helpful feedback 24/7. What are Smart Fitness Gadgets? You probably know what smart tech is by now. Smart fitness products are designed to make your workouts convenient. Most of them are connected to your smartphone with Bluetooth, and you can easily sync the device to your phone via an app. If you are a regular gym-goer, you can benefit big time from monitoring your training. These devices vary in function, size and usage which means they also vary in price. Be it keeping tabs on distance covered or calories burned, these gadgets are built to last and have unique features that keep you connected and make your workout sessions easier, smoother, safer and more fun (read: tolerable). Deciding to stay fit is one thing and maintaining fitness is an entirely different topic. Imagine having a smart water bottle that tells you when you need to hydrate? Or Bluetooth enabled dumbbells that double up as your strength-training partner. Look at it this way; you already spend a lot of time and energy to reach your fitness goals. So why not augment your image with some cool and stylish fitness gadgets? If these ideas interest you, we have prepared a list of 5 Cool Smart Fitness Gadgets for Gym Junkies. With a barrage of smart fitness products on the market, it can be daunting to find the right gadget that’s worth your money, especially if you are non-savvy. Whether you are just a little health-conscious or a regular gym-goer, each of the product we chose has a unique feature that makes it stand out from the crowd. Let’s dive into our list! Say hello to your new fitness bestie – Bowflex Selecttech 560 Dumbbells. Revolutionize your strength training with this set of smart dumbbells that can track your physical activity and be adjusted from 10 lbs. to 60 lbs. Lifting free weights has never been this fun. 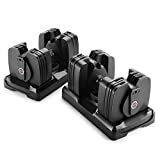 Just like conventional dumbbells, these smart dumbbells ship with interchangeable discs that you can use to increase or decrease weight easily. So what makes them smart? Touted as “the world’s smartest dumbbell,” these pair of dumbbells have internal sensors that can monitor fitness and workout data such as counting sets and reps, and tracking your weight, progress and personal fitness goals. The data delivers an intimate snapshot of your everyday fitness. Thanks to Bluetooth connectivity, you can seamlessly sync the dumbbells to your smartphone via the Bowflex Selecttech App. Drinking water has been proven to enhance brain function, elevate moods and increase energy levels. Just imagine having a smart bottle that doubles up as your personal hydration tracker. The H2OPal Hydration Tracker is every fitness aficionado’s dream come true. This smart water bottle by H2OPal tracks your day-to-day water consumption and hydration levels and alerts you when it’s time to drink up. This bottle seamlessly connects to your Apple Watch, iPhone and Amazon Alexa and shows you milestones notifications based on weight, age, physical activity and weather. Drinking water has never been so high-tech. The makers of this smart bottle understand that users want more than enhancing their form and fitness. For that reason, they designed this bottle as stylishly as possible. It has a minimal yet attractive design that will make it a joy to carry to the gym or office. A smartwatch will never get old as your training partner. It may not appear to be as fancy as other activity trackers in the market as it lacks an LED display, but Moov Now is very advanced. This second-generation activity tracker from Moov can be both your workout buddy and personal trainer. 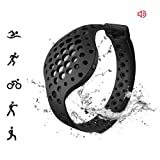 This activity tracker features a simple and basic design, and has 5 coaching programs (cycling, swimming, running, bodyweight workouts and cardio boxing). It will give you the much-needed guidance, suggestions and motivation that will get you through workout sessions. If you an avid swimmer, for instance, Moov Now will monitor your lap analysis, stroke type and count and suggest ways to improve. Moov Now has an incredible battery life of 6 months. Other standout features include waterproof capability up to 3 meters and a 9-axis motion sensing system. Thanks to its gyroscope, magnetometer and accelerometer, this device’s omni-motion can measure your movements in all directions, speed and force (3D). This results in better accuracy compared to other fitness trackers on the market. Integrated cross training app for personalized workout planning and in-ear coaching, Choose from more than 50 exercises, from beginner to advanced. If you combine cross training with running, the Track Fit motion sensor will measure distance, pace, steps, cadence and calories burned. Refer to the user manual and technical Specification sheet before use. Perfect and secure fit, will neither hurt or fall out. Multiple sized ear gels and ear wings to choose from to create a personalized fit. Listening to music while doing intense workouts out leads to faster, harder and extended pumps. I know what you are thinking: “Please, not another headphone!” These wireless buds check all the boxes. They are powered by Dolby and offer a great sound that will enable you to listen to music while working out. However, pretty much any earphones can do that and at first glance, they look like other audio headsets in the market. Believe me; I’ve had my fair share of “premium” wireless headphones meant for the gym. Most of these earphones are bulky, uncomfortable and not designed for tough workouts. What makes Jabra Sport Coach Headphones stand out is their true wireless nature and built-in health trainer that acts as your coach. Wasting time unraveling wires before you begin a sesh is outdated. See them as your own personal fitness assistant that motivates you to go beyond your limits. The Track Fit motion sensor will monitor your pace, steps, cadence, distance and calories burned. The headphones will allow you to set goals within the app and provide notifications on your progress. The perfect and secure fit means you no longer have to worry about this sweat and weatherproof earphones falling out during intense HIIT workouts. Yes, you read that correctly. A smart fitness hula-hoop may be precisely what you need to add a little fun to your workout routine. 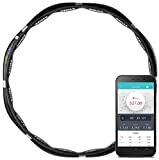 Unlike ordinary hoops, you can connect this smart hoop to your smartphone via an app and view the numerical value of all your workouts. It has internal sensors that detect your movements to give you an interactive training session. The app can track the length of your workout, the number of rotations and calories burnt. The large LED display means that you can view your stats as you work out. To intensify your workouts, you have the option of adding weights to the frame. The gadget is easy to assemble and disassemble, meaning you can easily pack it and carry it wherever you go. With an impressive 15-day battery life, the VHOOP Smart Fitness Hoop just needs one and a half hours to be fully charged. You probably know about endurance and strength shirts. If you are going to equip the rest of your body with stylish pieces of technology, don’t leave your feet behind. And if you hate tying laces as I do, Digitsole smart shoes have you covered. These crowd-funded bad boys have a self-tightening feature that will save you time spent on fumbling with laces. Touted as “the world’s first intelligent sneaker” Digitsole Smart Shoes can also keep your feet warm during training and automatically turn off this feature the moment they reach a temperature threshold. But this is not the smart feature that stands out. They have Bluetooth 4.0 connectivity that sync stats like steps taken, distance traveled and calories burned with your smartphone. They can also analyze your movement patterns and posture and suggest ways to improve your posture to prevent future injuries. You can charge these smart shoes wirelessly, and they boast a two-week battery life. The designers were able to give these water-resistant kicks a sporty yet stylish appearance. We’ve yet to see smart sneakers take off in a big way, but these futuristic kicks show that there’s no limit to the smart shoe possibilities. They are not currently available on Amazon, but they soon will be. If you have been unsuccessfully searching for clever gift ideas for your gym-goer friend, or if you have been working out daily with no noticeable improvements, our list will help you get started. Training without the right data by your side will not give you the results you expect. Using the right smart fitness gadgets will help you improve and track your workout.